PR Newswire (February 7, 2019) TrackLoop Analytics Corp. announced that it is signing a multi-year distribution agreement, focusing on refrigerated delivery vans for multiple use cases and industries, including Cannabis and Food. The agreement will open a strategic sales channel for the Trackloop in California, enabling it to scale the delivery of logistics and cold chain tracking technology in a key target market. TrackLoop’s real-time supply chain platform monitors temperature-controlled and highly regulated food products (fresh & frozen) in real time, securely and cost effectively, providing an enterprise grade solution to both large and small organizations. Marijuana Moment (February 6, 2019) Most California voters feel that legalizing marijuana has been “good” for the state. In fact, the state’s legal cannabis system is more popular among voters than Sen. Kamala Harris (D-CA), Gov. Gavin Newsom (D) or the state legislature. Separately, the poll also shows widespread support for clearing the criminal records of individuals who’ve been convicted of possessing marijuana. Sixty-four percent said they agreed with that policy, compared to 28 percent who did not. Los Angeles Times (February 7, 2019) The men and women collecting petition signatures outside Metro Super Market in Temple City warned of a marijuana takeover and greedy politicians eager to speed it along. They accused Andre Quintero, the mayor of El Monte, of wanting to make the San Gabriel Valley famous as a cannabis hub. But the city’s push into marijuana is facing an extreme backlash from its more well-heeled neighbors in the San Gabriel Valley, who fear cultivation will bring crime and blight. Some experts say it’s no surprise that opposition to marijuana businesses is coming from Chinese Americans. North Bay Business Journal (February 7, 2019) Sonoma County officials expect a dip in cannabis tax revenue in the coming fiscal year, down from $3.5 million in fiscal 2017-2018. That was due to many cannabis businesses in the unincorporated areas failing to meet the requirements of the penalty-relief program, under which the county allowed cannabis businesses operating before it was legalized statewide to apply for permits. Nine cannabis businesses opened in Santa Rosa over the past three years, contributing about $930,000 in tax revenues from the city’s marijuana industry, the Press Democrat previously reported. The Daily Meal (February 7, 2019) The world’s first-ever cannabis-infused non-alcoholic beer is expanding from Nevada to California. “Cannabier” — made by Two Roots Brewing — will soon be offered in both THC-infused and full-spectrum CBD-infused varieties and will be available for purchase at select dispensaries in markets including San Diego, Los Angeles and San Francisco. Cincinnati.com (February 8, 2019) Former House Speaker turned cannabis investor John Boehner on Friday announced the launch of an industry-funded lobbying group called The National Cannabis Roundtable. 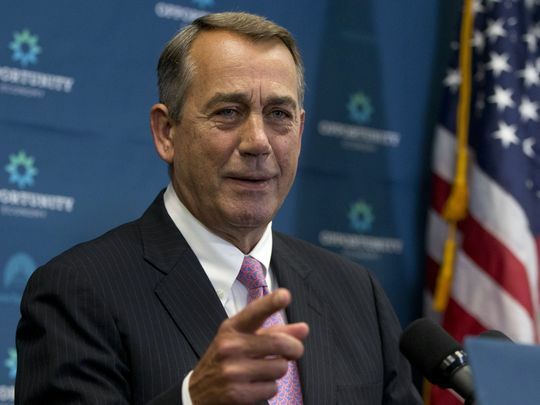 A Republican from West Chester in suburban Cincinnati, Boehner will chair the roundtable. It will represent legalized marijuana businesses in 23 states and the District of Columbia, including New York-based Acreage Holdings. Marijuana Moment (February 6, 2019) When members of Congress convene for a hearing on banking services for the marijuana industry next week, they’ll hear testimony from a state treasurer as well as individuals representing financial institutions, a drug policy reform organization and a medical cannabis dispensary. The hearing is the first of the new Congress to address federal cannabis policy. It will cover the challenges that cannabis businesses face in securing accounts and credit lines from banks that are wary of taking on clients with ties to a federally banned substance. Vox (February 7, 2019) The incident at Fat Cat Kitchen may be a sign of a broader crackdown on CBD happening in the city. It also suggests a broader uncertainty over the legality of CBD, which is increasingly marketed as a cure for ailments like migraines and anxiety. The Drug Enforcement Administration maintains that CBD is illegal since it’s derived from cannabis, but the Food and Drug Administration approved a CBD prescription drug — the first of its kind to be legally sold in the US — in June, per the New York Times. But the FDA has also said that CBD-infused products can’t be sold as dietary supplements, nor can they be sold in food that crosses state lines. Civilized (February 7, 2019) There is no question that marijuana, CBD, and hemp are fast becoming a very lucrative industry. State-legal cannabis is already a $9.7 billion industry in the US, and is projected to surpass $30 billion globally by 2021. But how can this newly wealthy and successful cannabis industry-at-large use its power to right the wrongs of the War on Drugs? Decades of prohibition, racially disproportionate over-policing and incarceration have ravaged minority communities around the country — now desperately in need of the kind of reinvestment that a new generation of weed money may be able to offer. Marijuana Moment (February 7, 2019) A Hawaii Senate committee approved a bill on Thursday to legalize marijuana for adults 21 older in the state. Last week, the Committee on the Judiciary held a hearing and listened to spirited testimony from advocates and opponents of cannabis reform. When the committee reconvened for its latest meeting, they voted unanimously to advance the legislation forward. If legalization is enacted, however, retail sales would begin in February 2021 at the earliest. PR Newswire (February 7, 2019) In the U.S., states are given the right to dictate whether cannabis can be legal for medical or recreational use, or even both. However, cannabis still remains a Schedule 1 drug according to federal law. The U.S. may represent a strong growth opportunity for cannabis-based companies, but many are building operations in Latin America. Countries like Colombia, Argentina, Uruguay, Peru are among the several countries where companies have already, or are beginning to, establish operations.